This topic has 37 replies, 23 voices, and was last updated 7 years ago by royAB. 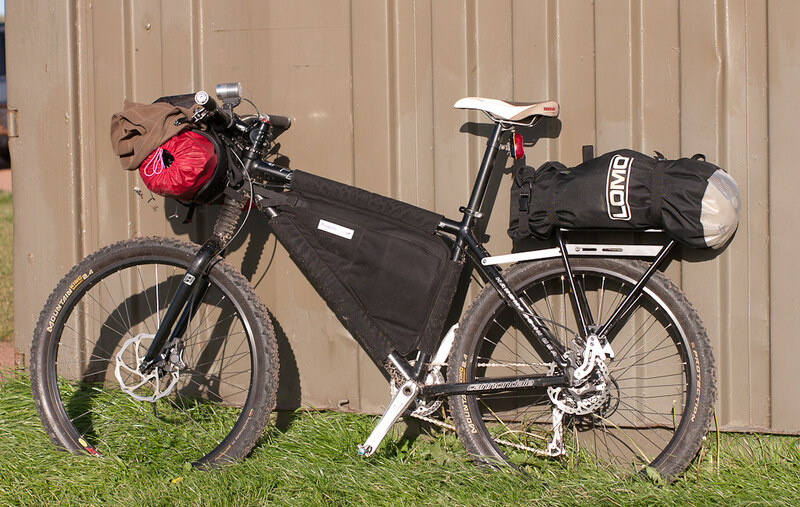 I recently commissioned Buggybags to make me a custom frame bag for my MTB. I had heard about these guys on this forum, and was keen to give them a go, as their waiting lists and costs were more realistic than the USA based makers, especially if you live in the UK or Europe. best make one for me and my bike. fitting it into the frame with string, taking a photo, and emailing that to Jon at Buggybags, we finalised the design and time frame for making the bag, and I sent the cut out template plus design brief off. The quality of the bag is superb, being made from strong cordura, with a water resistant backing. 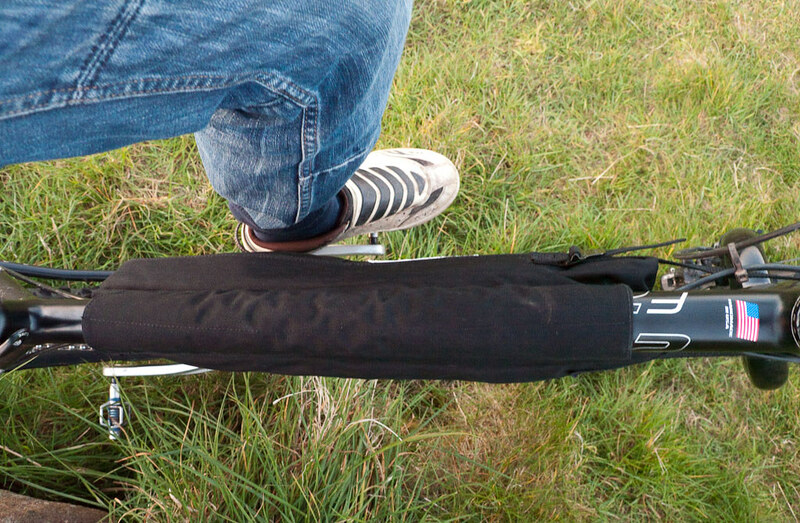 The bag fitted the frame very well, and all my design requests had been implemented. 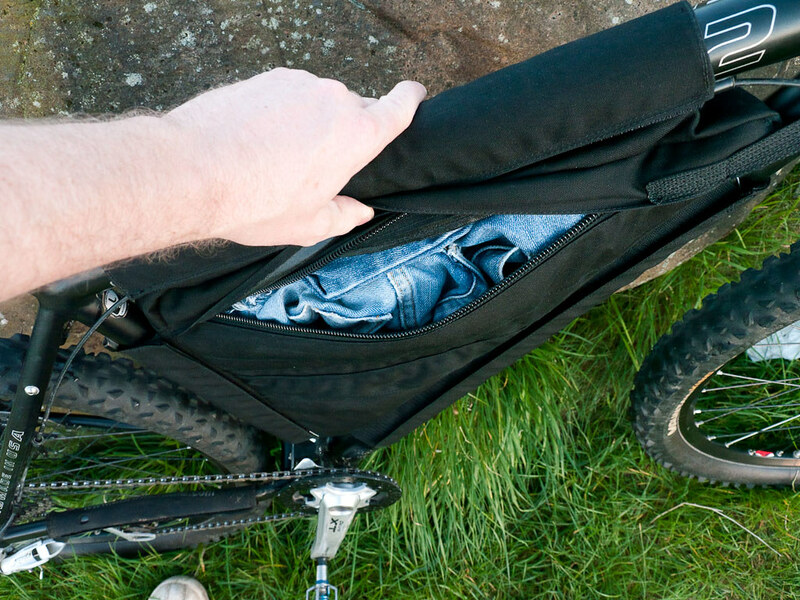 The bag attaches to the frame via three full length Velcro flaps. The Velcro is high quality – it took me considerable force just to peel it apart when I got the bag! Attaching it to the frame is easy, although a little care is needed to get it tight and even. There is also a strap that goes round the headtube. Once on, it feels like the bag is not going anywhere. forward or back to accommodate any long items, or even removed entirely if necessary. This is by far the best design I have seen, it is really versatile. I first tested the bag by filling the top up with bulky clothes, and the bottom with various tools, bottles of oil, etc. There is a certain Tardis like quality to the bag when it comes to smaller items, but remember that it is limited by the size of your frame and the width between your legs. I asked for the bag width to be 5cm at the bottom, to 7.5cm at the top front, which indeed it was. I feel these widths were about right, there is plenty of room round the bottom bracket – there is no chance of the pedal or crank getting caught. If there is any area that is going to contact, it is inner calves against the top rear section of the bag, but this only happens when the bag is filled up to bursting and I was wearing jeans and I was standing up, and even then it was only the flap of the map pocket that brushed past – not a big deal. compartment and the dimensional stability it offers. I’m sure that Buggybags would be happy to work on any design you can think of! I used the bag as part of my kit on an overnight bikepacking trip, you can see my post about that at http://www.singletrackworld.com/forum/topic/sick-as-a-dog-so-show-me-you-bivi-bikepacking-adventure-racing-gear/page/43#post-2592001 . I used the frame bag for cooking and food, my stainless steel pan, plus 2 100ml gas cans, Coleman F1 stove, food, and various other bits and pieces. For this, I removed the compartment floor and used it as one big bag, which in fact works better than using the divider, as the pan with all the cooking stuff can fit in nice and low, and all the food put above it. I have also used the bag on a thrash round the Glentress red / blue route, and on a bike / packraft paddle, the bag working fine for both things. Buggybags can also do custom embroidery. In retrospect, I wish I had got them to do their logo on the bag like this, rather than their standard white sewn on tag – I think it would make the bag look smarter – but this is really a minor niggle. for money to me. If you simplified the design – maybe just one zip and no map pocket, the price would be even less, representing outstanding value for a custom made bag. I was looking into making one and / or offering them to folk – but for that complexity at that price ( or even a chunk more) its great value. That looks fantastic and £50 seems to be very cheap. Think i’ll be getting in touch with them. First look at that I didn’t think much of it…second look I can see the attraction – no use for me as my frame design won’t allow anything like that to be used. Reckon if there is a strong side wind you will notice it and depending on how you carry your bike it might or might not work. However, as I’m pretty much driven by practicality, I think it looks really good. Ive got one as well. A smaller and simpler version that jon did for me for £35. It is absolutely brilliant. I must try and get some decent photos for him. I tested it out on a 50k ride thru glen kinglass and it was absolutely brilliant. Doesnt bag out, doesnt move at all. Seems really well put together. Absolutely brilliant and all the bikepackers should get one. 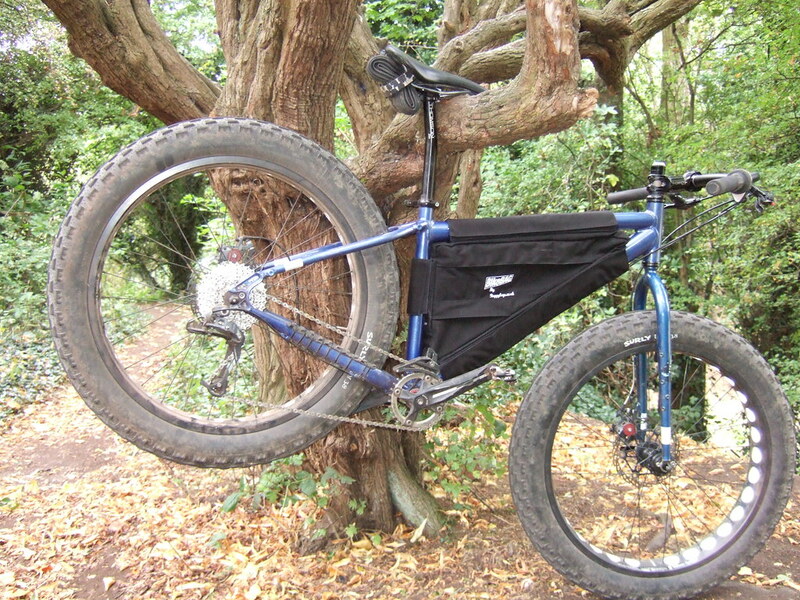 general thinking with framebags is that they dont add any more cross section to catch wind than pannier bags and because they are more central then its less of an issue anyway. coastkid – yeh, framebag rideout anytime, gimme a shout! They don’t do seat bags AFAIK, but I think they’ll give it a go if you do them a design. TJ – order one up quick, I think they may get busy with these framebags. myheadsashed – were you the one that first asked Buggybags about this? 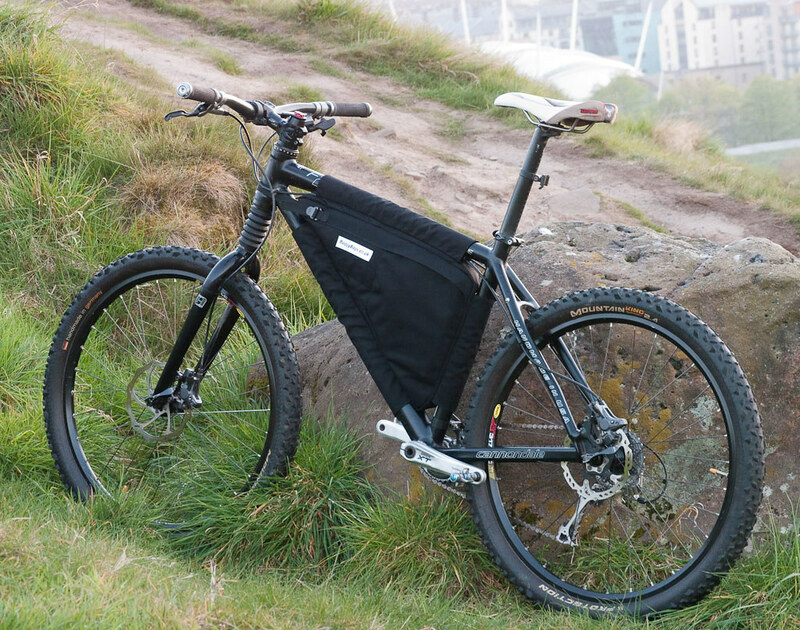 DickBarton / cruzheckler – these type of bags are established and tested, as meikle_partans says, they add no more cross section than panniers, and it is all low down. Most wind effects are on the human riding the bike, that is the biggest cross section. I rode out last weekend in approx 20mph winds, and it was no problem. 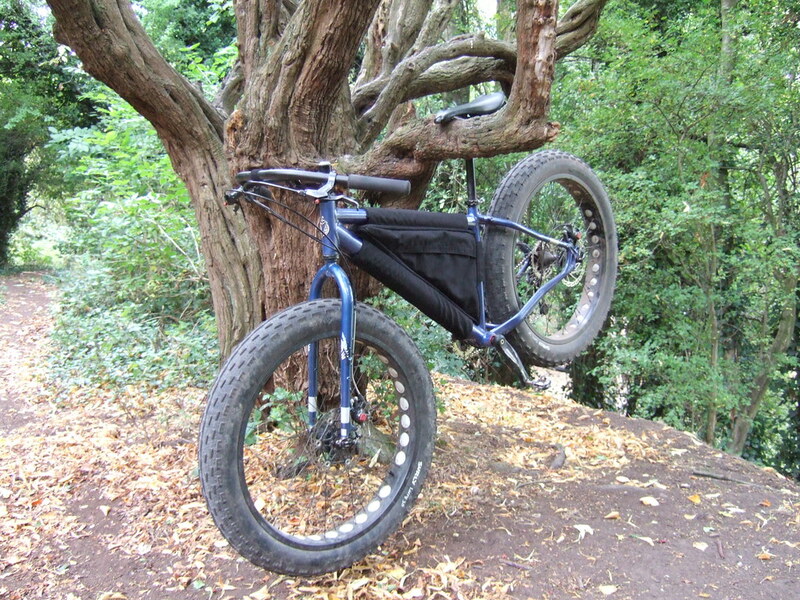 First posted it up on here many moons ago, I was after a Revelate bag an showed a piccy to a friend who is a keen buggier and he has had stuff made by Buggybags before so he suggest I try Jon. @ Pete – I’m surprised you haven’t beaten me to it! mine arrived Monday – very well made – just looking forward to trying it out now! John and Helen (Buggybags) are lovely people. I have ordered many products from them for kite buggying. Have you got around to using your bag yet? that looks good, and a bargain at that price. about time there was a group test in the magazine comparing it with Wildcat and Epic Designs. I have the occasional stroke of genius……..
*sorry. Purile humour intervention. Please carry on. As you were. up the west coast in torrential rain from the get go. that plus ample river and burn crossings, the bike breaking and having to hike it out. and then the bike broke again and the bike plus bag sat behind a car for the rescue. once i got where i was going i was too cold and hungry to remember the bag so it stayed out in the rain. was there a frisson of dampness at the end? yes there was but less than a lot more expensive kit i’ve and, to be fair, may have had as much to do with me being out and in the bag earlier in the day. once the bag was on i forgot it was there. i had no problems with width or windage or the like (all my problems being rohloff related). i’d take it on a day out again without a second thought. tried my frame bag out last night – nothing too exciting just a ride up the Brynmore tramroad in the Beacons to a bivi site with my lad on his first bivi. He was travelling light so I had a fair bit of kit and the bike bag was excellent. It’s very secure on the frame, well made and swallows a load of kit – I’m very pleased with it! My Buggybags bag turned up today. Can’t wait to get out there and try it. The construction and fit seem to be top notch. I went for the double zip on the right with a removable devider between the two compartments. This can be removed to leave you with more room for larger items. There’s a velcro map holder pocket on the left. Jon was also easy to deal with and very obliging despite being busy moving house. I’ll report back more after it’s been used a few times. Wonder if they would consider making a seat pack like the ones from the states? 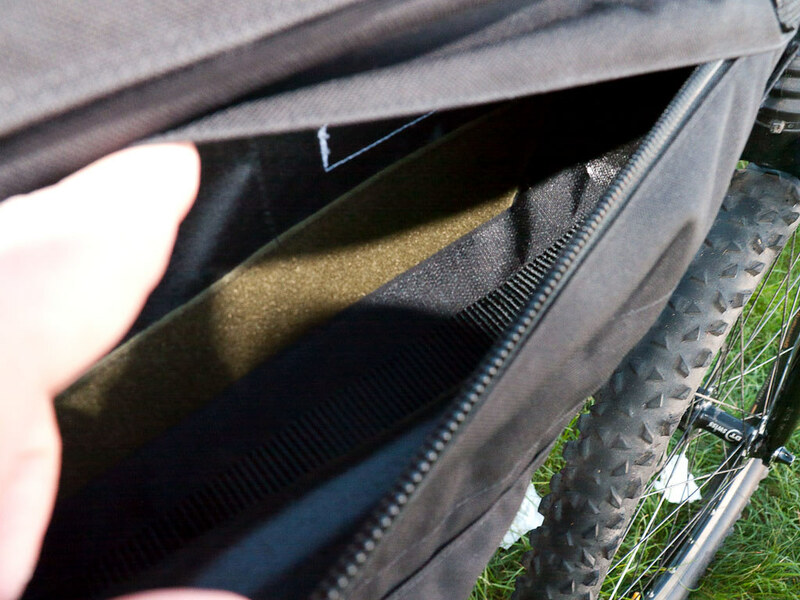 Vortex – check out Bikepack. Way cheaper than ordering from the States. A few good reports on Bike and Bivi. Top bags Ive got one of these and the fit and workman ship is great for the money, just waiting to hear about a seat bags, cant wait…When are you going to start making them..
Just got my bag from Jon. Not ridden with it as yet, but first impressions are that this is a fine piece of kit – fit is perfect, finish fantastic. Will post more when I’ve had a chance to use it in anger. 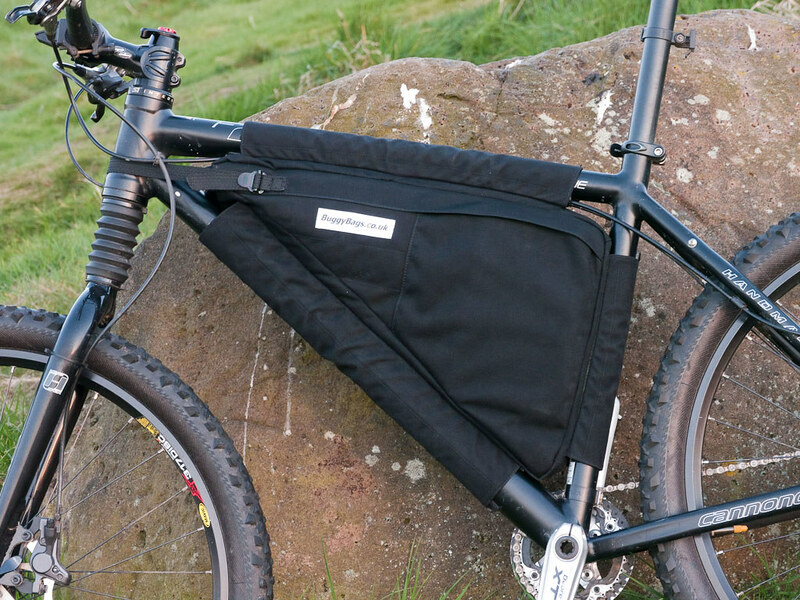 Great bags, just need them to start making saddle bags, wonder when thats going to happen???? Mine now used for a couple of rides (100K around Norfolk & 150 on last weekends BB200. Very happy. Fit, fill & forget. (NB for anyone looking to get one, Jon uses very strong velcro!) 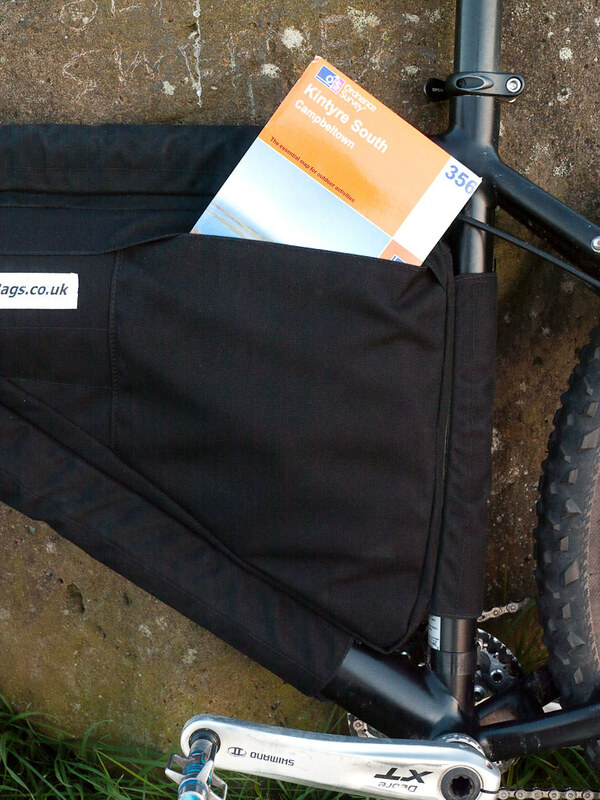 Now, if only there was a BuggyBags saddle bag …. 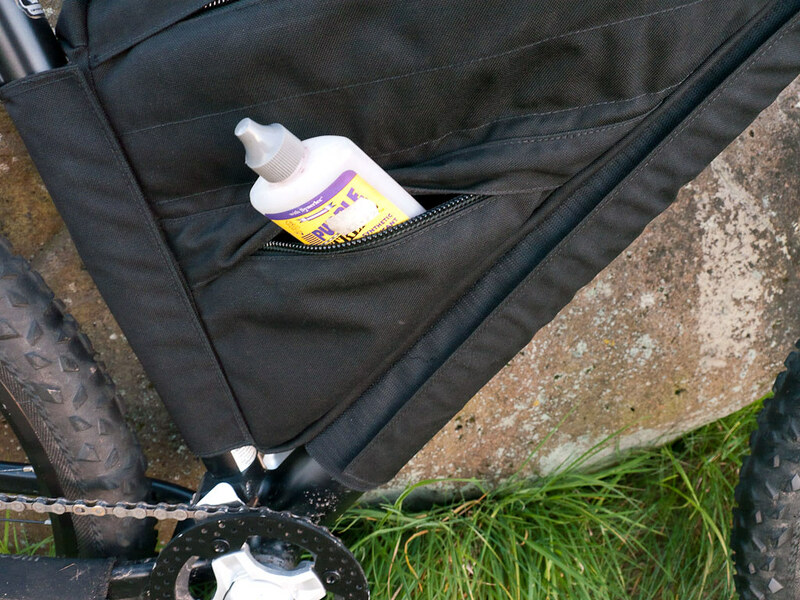 Sorry Trekster, probably a little late for an answer to your question, but might be of interest to anyone following this; My bag still doing fine after numerous (power) washes to get rid of mud/crud – I just leave it on the bike these days as it’s more of a hassle to take it off each time and it’s ideal for just ‘bunging things in’ when I set off.. 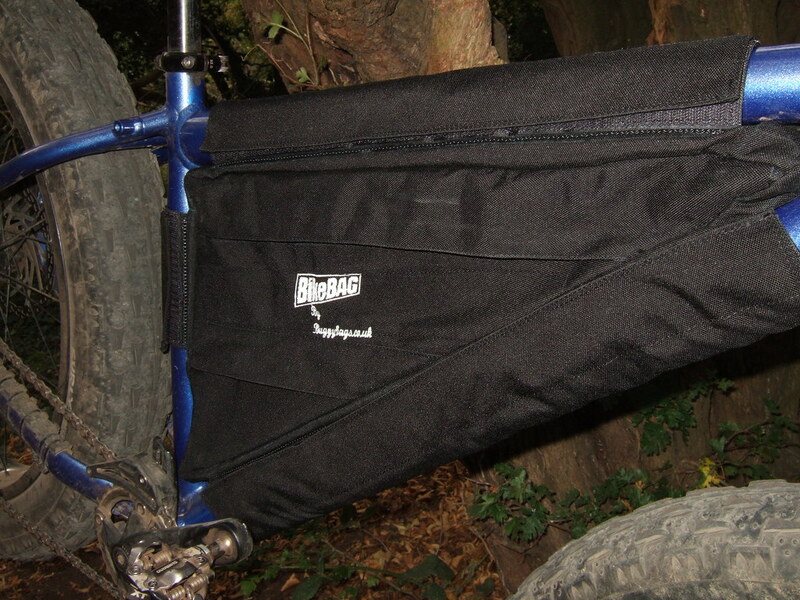 The topic ‘Buggybags Custom MTB Framebag – Full review with pictures’ is closed to new replies.